Isn't it funny how we claim to be the better and more intelligent species yet we do the things we do to ourselves and to others? How can we be greater than the pets we own when our lifestyle is not worth owning any animal at all? Humans have done so many horrible things to other people and animals of course, it would be just too heart wrenching to list them all. From wars, to hunting, to racism to greed and just pure evilness. Not many people are obedient to the right things today. Many people find it hard to follow the good rules to keep us from harm and chaos. How safer and more secure a world we would have if more people were obedient to the good way of life. How many people do you know that you can honestly say are faithful? We know people are not perfect and are seldom to make mistakes, but unfaithfulness today seems to be running rampant among families and other groups. If humans were like dogs, faithfulness would multiply by a million folds. The world as we see it would be so much better. What we seem to emphasize protection on these days are what seems to be deteriorating society. We humans must ensure that good sense and quality way of life is always protected. A discipline and free society is a must for growth and prosperity. If we were more like dogs, the little goodness left in mankind we would guard with our lives. Dogs are very loving animals. They will stay by your side and show you love even if you don't. Humans need to take a big slice out of this cake and follow suite. We must love, love strong, love wise and love without discrimination. If you ever want to see a big turnaround for good on this planet, we have to love like a dog. Where has all the humbleness sunk to in humanity? Every country seems to be down each other’s throat. Everyone has weapons to defend themselves and no one is taking any talk from anyone else. We all need to eat some humble pie and be as humble as a dog. A dog will know that it is strong and powerful, yet will not retaliate when a baby pulls it's ear or mess around with its tail. When man has power, he seldom thinks straight. His humble button is jammed and he leads the world into destruction. What Causes Dogs To get Worms? Worms in dogs are usually caused by the digestion of rotten or contaminated foods. Dogs also become infected with roundworms by eating eggs from contaminated soil or stool, or by eating infected rodents like rat and mice. Hookworms are contracted by ingestion of microscopic larval by mouth or from larval entry through skin, usually on the feet. Once these worms get hooked to the stomach, they will live and reproduce if not properly treated. What are the different types of intestinal worms in dogs? 1. Roundworm in dogs. There are two species of roundworm which can affect dogs; Toxocara Canis and Toxascaris Leonin. These two species of roundworm basically carry out the same destruction on your dog. Both are long, white and spaghetti-like in appearance and takes away much needed nutrients from the infected dog. These roundworms are commonly spread in feces or during pregnancy or nursing. The Toxacara Canis is a burrower and will move from the intestine to the dog's lungs for further growth. It then will move up into the airway where it is coughed up by the dog and then swallowed again. Then the cycle of this roundworm continues. This worm may cause serious illness in your dog or worst, your puppy. When you feed your dog which is infected with roundworm, you are basically feeding the worm also because it interns feed off the food of it's host. This can lead to diarrhea in your puppy and other ailments which can be fatal to your pup. The Toxascaris leonina do not move around the body of the infected dog and have a far simple and shorter life cycle. 2. Hookworm in Dogs. Hookworms are short, blood sucking parasites with teeth. Sounds like a vampire if you ask me. An infected puppy left untreated will loose blood and nutrient on a rapid basis and eventually die. On of the bigger problems is that these hookworms don't stay put. They have similar life cycle patterns to it's cousin parasite, the roundworm Toxocara Canis.They will move about the body of the pup to the lungs to mature before re-entering the intestine. 3. Whip Worms in Dogs. Whip worms live in the large intestine and don’t extract as many nutrients as other types of worms. Unless the worms burrow into the intestinal tissue, they pose few problems and rarely cause symptoms. They do occur in the UK but aren’t common. Tapeworm in Dogs. They live in the small intestine of the infected dog. Like any other parasite, they grab on to the host and begins to absorb nutrients digested by the animal. They are long – half a foot or more in length – and flat in appearance. Unless the dog is extremely active, the parasite does not harm the pet, as there are plenty of nutrients to serve both host and tapeworm. When excreted, the worm normally splits into segments which look like small grains of rice. 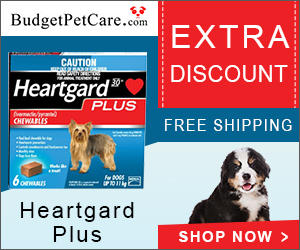 Heartgard Plus is a heart worm preventive treatment that also controls and treats various other worm infections. It also treats hookworms and roundworms. Don't wait till it's too late. How Often Should You De-worm Your Puppy? Well, one has to remember that puppies are born with worms and must be dewormed early. Puppies are much more vulnerable to worms and other illnesses due to low immune systems, they will need to be dewormed much more often than large or adult dogs. Waiting until 6-8 weeks of age to worm puppies and kittens allows them to spread worm eggs that will contaminate the soil and re-infect them. Puppies should be dewormed once every two to three weeks up to age 3 month. After they pass the three month period, deworming should be slown down to to once per month until age of 6 month. 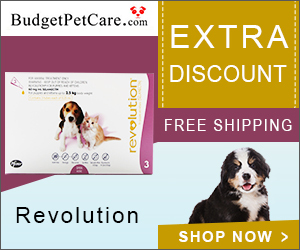 Revolution is a multi parasitic preventative, which kills fleas, flea eggs, flea larvae, eliminates gastrointestinal worms and prevent heart-worms. It also controls tick and reduces the chances of the occurrence of tick borne diseases. These are the most common signs that your dog has worms. Clean up feces immediately. Don't let dog poop fester in the ground and lay eggs in and under the dog's feces. Dogs will become reinfected with worm even after a deworm simply because these worm eggs are living in the dog's environment. If you suspect that worms are living in the soil. Dig up and use hot water to pour in the area where you think worms are breeding. Or use bleach to destroy the infected area. Ensure that your puppy or adult dog is not prone to swarms of mosquito bites. Get a good deworming treatment and deworm your large dogs once every three months to prevent infections and reinfection. Get the right worm protection: You can get the right worm protection for your dog to mitigate against becoming infected or simply getting rid of worms in dogs. Have you ever been to the vet and notice a few dogs with what looks like a cone around its neck? That is not a new fashion statement that the vet is promoting and there are no modeling agent waiting outside to give the dog a contract. That cone that is placed around the dogâs neck actually serves a couple useful purposes. It is known in the dog community as the cone of shame. But the real name is the Elizibethian Collar It is also referred to as, E-Collar, Buster collar or pet cone. Why is it called that? I thought you would never ask. Back in the old time colonial days when Britain decided that every piece of land on district Earth was belonged to the queen, there were fashion statements being made in the Palace. Queen Elizabeth had a fancy way of dressing where she wore dresses with enormous collars that ascended from her neck line all the way up to her mouth area. These were royalty wear and many prominent English ladies also did the same. The E Collar or Pet Cone as simple as it seems is quite ingenious. When dogs go to the vet for various illnesses. If the animal receives surgery, stitches, patches over rounds or anything of that nature. The animal will always tend to lick the area where any foreign matter is such as those stitches and patches. Pet cats and dogs have been known to gnaw away and even chew out stitches and patches causing wounds not to be properly healed. If the animal licks and chews those unhealed wounds, it can cause irritation and infection, which may leave a hairless, discolored, ugly scar for life. The cone of shame or E-Collar is placed over the dog or catâs head and prevents the movement of the head to chew at those tender areas of the animal. The cone serves the same purpose as a claw wrapping which would prevent the animal from scratching away at wounds to create further damages. Not many dog owners are fund of the cone of shame and of course, no dogs like to have that big old plastic thing around its head looking liking a barking bulb. So they have had several alternatives to this E-Collar. Can my dog eat with an E collar on? If your dog normally eats or drinks from a deep bowl but refuses to eat with the collar on, try offering food in a shallow dish or plate. If you feel you must remove the protective collar, make sure your pet is supervised while eating, and replace it as soon as the meal is finished. But why go through all of that when there are good alternatives to the cone of shame. Who wants a plastic cone around their dogâs neck causing the animal discomfort when they can get a comfy collar to replace the cone of shame. This comfortable alternative to the cone of shame is made from nylon and foam material which brings flexibility along with comfort for your dog. This comfy collar allows your dog to have the natural abilities to feeding and drinking because it has âStaysâ which are removable. These âstaysâ keeps the foam structure intact. The cone remains secure and holds its shape by attaching it to the petâs collar using loops on the device. The Comfy Collar features a reflective fabric to keep you and your pet safe while going outside at night. This medical device comes in six sizes and can protect both canines and felines. Ditch The Cone of Shame. Your vet will not supply these fancy collars, they will definitely fit your dog with that cone of shame. If you know that your dog may be up for stitches, wound cleaning or another vet service. Ensure that you get the dog a collar which will make him/her comfortable even after leaving the vet. Are Pit-bulls Really an Aggressive Dog Breed? For probably most of my life (quite q good number of years) I believed all the viscous prejudice about Pit Bulls. Interestingly enough their breed is actually American Staffordshire Terriers; were once considered the "Nanny-Dog" because of their gentleness, behavior, loyalty, and loving . Then the drug dealers, criminals of all distinction chose this particular breed to teach them to kill . (Any breed could have been chosen. What if they had chosen the Collie?? America's beloved Lassie!!) The methods used to do this were unspeakably horrible. But there are many levels to this question, and the short answer is…no, because you can’t breed “aggression.” You can only teach it. This is a breeding grouping that consists of several breeds, each of which have a different history. They essentially all came from a mixture of bulldogs and terriers (hence, “bull terrier”) but several lines have descended from that mix. To say that a Staffordshire bull terrier will have the same temperament as an American pit bull terrier is foolish, but in America, both will be called a pit bull and are subject to breed-specific legislation aimed at pit bulls. The reason this is important is because when some site puts together bite “statistics,” they are putting anywhere from 4–30+ breeds into one grouping, them comparing them collectively to individual breeds. 2. Because of their appearance and reputation, pit bulls are far more likely to be obtained by someone wanting to use them as a status symbol or guard dog. Dogs in such a position are not properly socialized, are often kept outside instead of with the family, and are far more likely to get loose. Due to this, it is probably statistically accurate to say that a higher percentage of pit bulls are aggressive than other breeds, but it’s not due to some genetic difference. If our society treated other breeds the same way we treat pit bulls, you can bet those other breeds would be seen as far more dangerous. 3. As I mentioned earlier, you can’t breed aggression into a dog. You will often hear that pit bulls were bred specifically to be fighters, and in many cases this is true. But the traits that were bred into them for this purpose are traits that can be easily re-purposed for a loving family dog. For instance, pit bull breeds were bred with exceptional loyalty. If you want to teach a dog to fight and kill another dog, then you need a dog with that kind of loyalty to its master. The pit bull isn’t fighting the other dog because it wants to, but because its master wants it to. It’s like nuclear power…you can use it to power a city or to flatten a city. Another trait is a high pain tolerance, which obviously would be good for fighting. However, this also makes them less likely to turn on a child that pokes them in the eye or to hate human beings after one mistreats them. There are stories upon stories of pit bull breeds being brought to shelters in terrible shape with all kinds of illnesses and wounds, and they turn out to the be sweetest dog in the world. That’s the forgiveness of a pit bull. All of these things lead to one very important truth: pit bull owners need to exercise a greater responsibility than most other dog owners. There is a target on the back of every pit bull. You may want to bring your dog to the dog park and let him loose, but what happens when a black lab attacks your pit bull? Regardless of the outcome, the pit bull will be blamed, and until those attitudes change, pit bull owners need to be especially vigilant in protecting their dogs from the results of stigma. Being a dog in Dubai may be one of the best things to happen to any canine. Dogs that have become strayed either by owner passing off or owner migrating and leaving everything behind, including their pets, will find refuge at dibai's cool air conditioned dog park. DUBAI // Tight rules on where and how dogs can be walked in the emirate have left few options for people who wish to let their pets run free. That is changing, thanks to a joint project by a Saluki breeder and two pet lovers who have opened Dubai’s first outdoor park designed for dogs. The site in Al Awir, backed by Dubai Municipality, is the only outdoor space where dogs can run without their leads in a safe environment. Jan Al Mheiri, a Scot who has been in the UAE for more than 25 years, encouraged her Emirati husband to donate farmland near their home in Al Awir. The Bark Park has been developed with irrigation and electricity and opened as an official dog-walking facility. Mrs Al Mheiri, who owns two Salukis and a Golden Retriever, said it would encourage responsible dog ownership. “We are a work in progress but we have very big plans for the future,” she said. “It is a traditional place but it has all the things that dogs need. In Dubai, dogs are banned from all beaches and public parks, and in most newer developments. The Bark Park encourages owners to socialise and can be used for a fee that funds the project. “We needed to have permission to have the dogs running free on the land and that took time,” Mrs Al Mheiri said. Saturdays are reserved for Salukis, the traditional Bedouin dogs, which can run as fast as 70 kilometres per hour. Hamad Al Ghanem, founder of the Salukis of Arabia Club, helped to develop the park project. “We approached the landowner with the idea, as we were looking for somewhere to run the Salukis,” he said. “It was important that it was somewhere away from camel farms and safe for the dogs. “We had to have the area checked to ensure that they can’t escape if they are running free. It needs more trees and shade to make it more like a park, but it has great potential. Other plans include a barbecue area and a site office. Dogs which use the park must be vaccinated and microchipped, and nervous dogs should be muzzled as a precaution. Children younger than 12 are not allowed in the park. There is an area reserved for smaller dogs. Entry fees are Dh50 for the first dog, and Dh25 for a second and third. A maximum of 20 dogs are allowed in the park at any time. Anna Bensalah has been volunteering for the park project and promotes events such as the Saluki Fun Run, which she has been organising with Rooster Tail Sports and Entertainment. “The Saluki Fun Run was popular, so we realised there was a demand for a more permanent outdoor park for dogs to enjoy,” she said.